It went down to 23° here in Santa Fe last night, our lowest so far this year. But we made it through with no problems. Our water bay, where I installed the heat lamp last night, never dropped before 37°. I also wrapped a towel about our site water faucet, a PVC pipe that extends about 2 feet above the ground, And when I checked this afternoon it was still OK. The only thing I ‘OOPS’ on was that when I was being sure my truck door wouldn’t freeze up by opening it several times during the evening, I completely forgot about Jan’s side of the truck. So when I went out this morning it took me about 5 minutes to get it open. 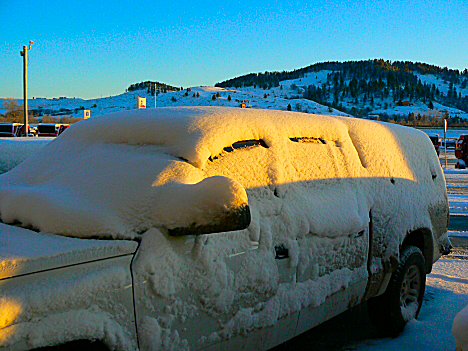 Of course it wasn’t as bad as in 2008 in Sturgis when it took me over an hour to get in then. I did go outside about 8:45, cranked up the truck, and then turned the defrost and heater on High, so the windows were clear and the inside was toasty when we were ready to go. Originally before the storm came through, we had planned to leave the rig about 9:45 for Jan’s 10:30 appointment this morning. But with this weather, we left home a little after 9am. Based on all the reports, I was expecting a real mess on the roadways, but zero, zip, nada. The roads were clear and dry. I wasn’t planning on taking I-45 north due to the many overpasses along the way, and the news reports of all the wrecks this morning. I just had to get over the FM646 overpass and over to Hwy 3. I figured then I’d be home free with no overpasses. And if I couldn’t get over on 646, I had a backup route to turn around and then take FM517 up to Alvin and then into Clear Lake on FM528 with no overpasses along the way. But this would take a lot longer so that’s why we left so early to allow for this reroute if necessary. But the 646 overpass was heavily sanded and not a problem, and it was clear sailing the whole way to the hospital. Jan’s procedure was scheduled for 12:30 and it all went pretty much on schedule. They have a really neat service where they text you as things happen during the procedure. For instance, I got one when she was taken into the Operation Room, another when the procedure actually started, and another when she was taken to the Recovery Room. Everything went fine with the lithotripsy, and we were on our way home by 5pm. She said that she was really surprised that she was not having any pain or soreness and probably won’t need any further painkillers. On the way home we made a Jason’s Deli stop for a couple of large Broccoli-Cheese soups for Jan to have over the next couple of days. She’s got a follow-up checkup on Feb. 2nd and then hopefully will be done.